If you have your own AWS account, you can "bring your own cloud" (BYOC) to CONS3RT. 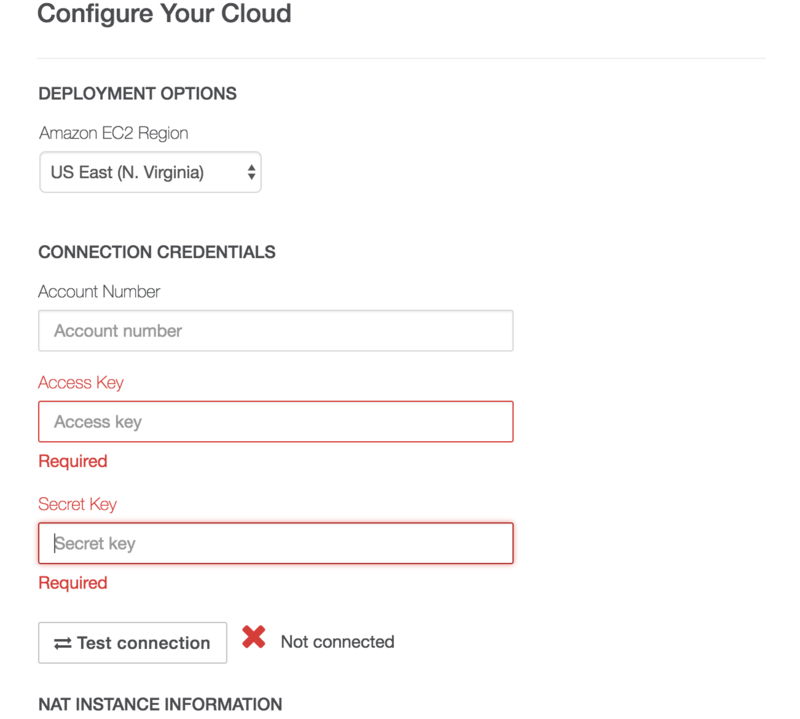 To do this, register your AWS account as a "Cloud" in CONS3RT. Name the policy "AA-Cons3rtCloudApiUserPolicy", and click "Create Policy"
Next, click on "Groups" and click "Create Group"
For the group name, use "cons3rt-api-group", and click "Next step"
Click "Next Step", and click "Create Group"
Next, click "Users", then click "Add User"
Type a username that you will remember like "cons3rt-cloud"
Check the only "Programmatic access" checkbox, and click "Next: Permissions"
Add the user to the "cons3rt-api-group" by checking the box, and click "Next: Review"
Amazon provides Amazon Linux AMIs for performing network address translation (NAT) and port address translation (PAT) to and from EC2 instances in your virtual private cloud (VPC). When configuring your AWS account in CONS3RT, you need to provide an AMI ID to use as the NAT instances for your cloudspace. Each AWS region has several AMIs that you can use for this purpose, this is simply a list of recommended AMIs that have been tested by the CONS3RT team. You are also welcome to build your own AMIs for this purpose. 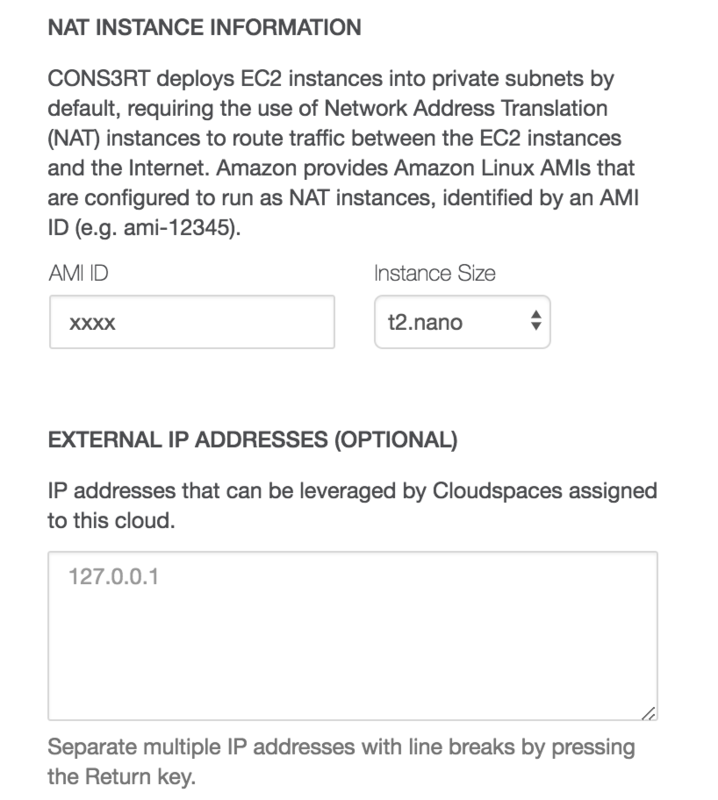 From the EC2 Dashboard, click "Launch Instance"
Look for AMIs named something like "amzn-ami-vpc-nat-hvm..."
From the EC2 Dashboard, click "Elastic IPs"
If prompted to select between "VPC" and "EC2-Classic", select "VPC" and click "Allocate"
Note the IP address for later use. Repeat if you need to create multiple cloudspaces. You must be a Team Manager for your CONS3RT team in order to complete the remaining steps in CONS3RT. Add any elastic IP addresses created from Step 1, and click "Next"
The next step allows you to configure networks that will be created in your cloudspaces. 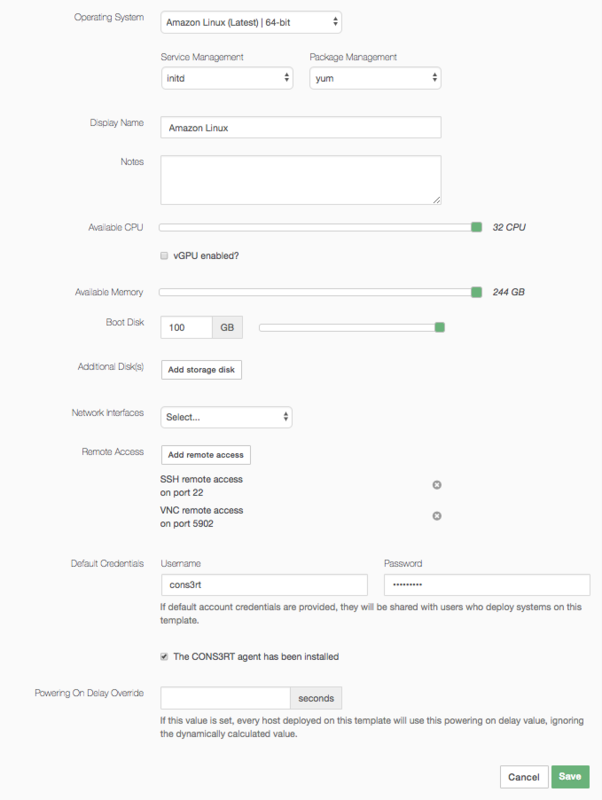 CONS3RT creates a VPC to contain your cloudspace resources, and for each network created at this step, CONS3RT creates a subnet, network ACLs, routing tables, and security groups to support the network firewall and NAT rules. We also recommend creating a second "user-net" to enable communications to the Internet, and communications between your EC2 instances. Please see these instructions for configuring a standard user-net. Allocate a Cloudspace into your AWS Cloud! Click "Next", and CONS3RT will automatically create your cloudspace in your AWS account! You can optionally click the "Add more" button to add other members of your team as cloud administrators. Cloud administrators can edit cloud configurations, and allocate new cloudspaces. From the main menu, select "Cloudspaces"
Click "Add", search for your project by name, select it, and click "Done"
Enter a support ticket to support@cons3rt.com and the team will share these templates with your cloudspace. Congrats! You can now deploy that OS in your AWS cloudspace!